An aging structure, considered unsafe for the public and set for demolition in the coming weeks – is at the centre of a last-ditch effort by some members of the surrounding community to save the structure from its fiery fate. Spaca Moskalyk stands on a crumbling foundation near Mundare, less than an hour’s drive east of Edmonton. 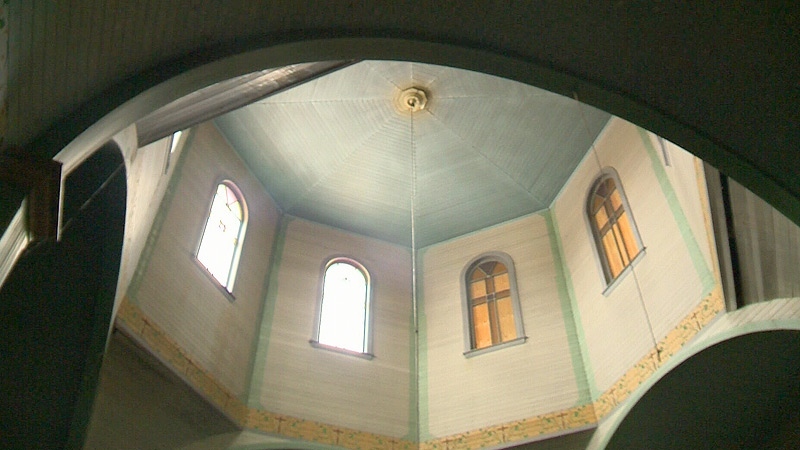 The building’s place in Alberta’s history is palpable, it was built 89 years ago on a site where Ukrainian Catholics have worshipped for more than a century and some of Alberta’s first immigrants are buried there. In recent years, the building became more and more unsafe, and was finally abandoned altogether. So, in 2011, parishioners voted overwhelmingly to demolish the structure, by burning it down – as engineers said the cost of repairing the foundation neared $750,000, an expense the church couldn’t come up with. Now, a last-minute effort is underway to save the building – parishioner Clifford Moroziuk said there are ways to fix the church at a much lower cost. In anticipation of the burning, the historic designation of the church was transferred to the neighbouring bell tower, which Moroziuk said adds a number of new options that previously couldn’t be considered. “What we would be looking at doing is putting steel beams under the centre part of the church supported by either concrete or screw piles,” Moroziuk said. “Then we would paint the church and redo the roof on the church. Moroziuk plans to gather names on a petition to see if fundraising could still be an option, but time is running out. The church is supposed to be burned before the spring; a date for demolition has tentatively been scheduled for March 9. If the church is set ablaze, it will be used as a training exercise for a number of volunteer fire departments in the County of Lamont. 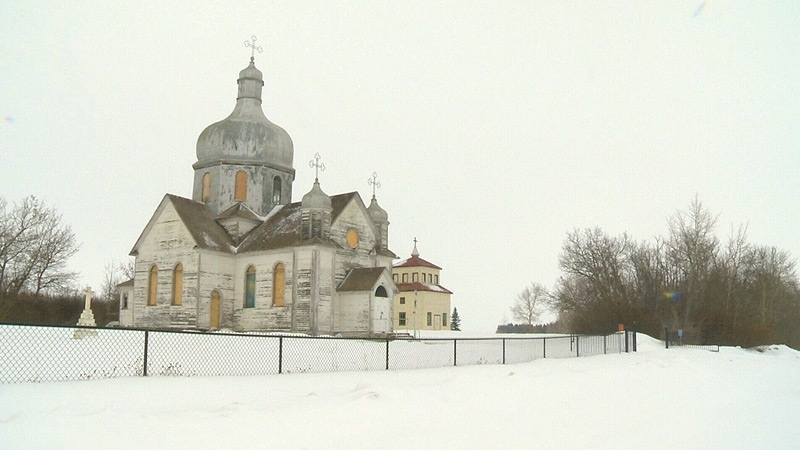 However, now that the story has received so much attention, the Ukrainian Catholic Eparchy of Edmonton is looking at the possibility of demolishing the building in some other way than burning. Spaca Moskalyk, near Mundare, Alberta, has been abandoned for some time, after the church's foundations were found to be beyond repair. Many of the windows in Spaca Moskalyk have been boarded up, as the building has been battered by the elements since it was abandoned. 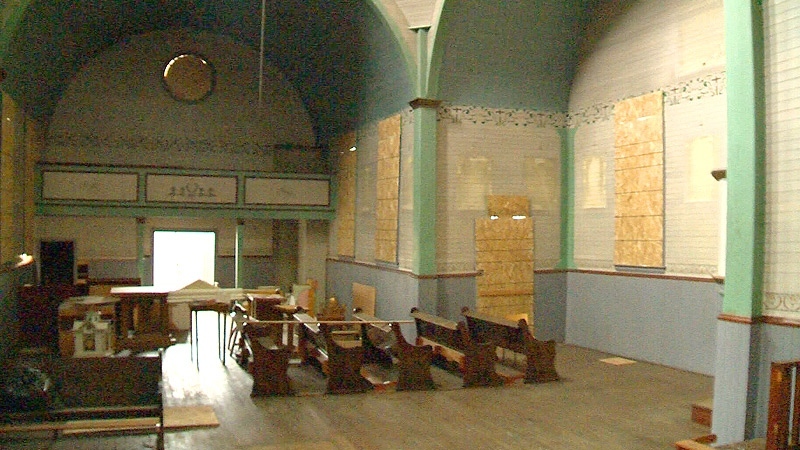 Inside the church, a number of pieces of furniture such as pews and tables appear to have been left behind.